SPARROWS POINT, EAST BALTIMORE: Project received $20 million federal grant for the Mid-Atlantic Multi-Modal Transportation Hub. Port-related projects were awarded $72.7 million in TIGER Round 9 grants. AAPA president and CEO: “We’re disappointed there weren’t more” port projects in the ninth round of TIGER grants. Five port-related projects were approved for discretionary TIGER grants. Last week, the US Department of Transportation announced its list of recipients for $500 million in discretionary grant funding for road, transit, maritime, and rail projects in Round 9 of the Transportation Investment Generating Economic Recovery (TIGER) program. Of the 41 projects awarded grants in this round, five are port-related, and only two (out of 40 port applications submitted) went to maritime port authorities. Port-related projects received a total of $72.7 million, or about 14.54 percent of the nearly $500 million available. As a percentage of the total the port-related grants were consistent, or even a little better than average, with the history of TIGER, although the American Association of Port Authorities (AAPA) has long called for port-related projects to receive at least 25 percent of the grant total. In TIGER’s first round, in fiscal year 2009, port-related infrastructure projects received 8.6 percent of the original $1.5 billion allocated. Through subsequent rounds, port-related infrastructure did better, garnering 14.6 percent (of the total $600 million) in the second, 12.8 percent (of the total $527 million) in the third, 13.6 percent (of the total $500 million) in the fourth,13.3 percent (of the total $474 million) in the fifth, 12.4 percent (of the total $600 million) in the sixth, 9 percent (of the total $500 million) in the seventh, and 12.36 percent (of the total $500 million) in the eighth. Kurt Nagle, AAPA’s president and CEO, noted that direct funding for maritime infrastructure projects, including connections to ports, will improve freight mobility which helps reduce transportation costs and makes US exports more attractive to overseas buyers. 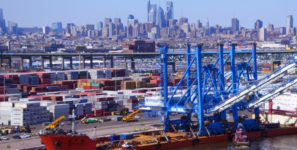 Baltimore County, Maryland, will receive $20 million for the Mid-Atlantic Multi-Modal Transportation Hub to build cargo-handling facilities at the Sparrows Point industrial facility in East Baltimore as part of a larger investment to repurpose a former steel manufacturing site into a multimodal logistics hub. The City of Burlington, Iowa, will receive $17 million for its Downtown/Riverfront Revitalization Project, which includes new boat ramps and docking facilities for river cruise lines and recreational boaters. Louisiana’s St. Bernard Port, Harbor and Terminal District will receive $13 million to rehabilitate to modern design standards the last two original wharf sections, A and F, which have been maintained but have exceeded their useful lives over the past 110 years. The Alabama State Port Authority will receive $12.7 million to convert an abandoned bulk handling facility at the Port of Mobile into a roll-on/roll-off mobile vehicle processing facility. The Indiana Department of Transportation will receive $10 million for the Wabash River Rail Bridge Infrastructure Revitalization Project to replace two deteriorating freight rail approaches to the Wabash River Bridge. The bridge serves as a rail link from energy and agricultural suppliers of Illinois to river ports in Mt. Vernon, Indiana, part of the Ports of Indiana.